Tunica’s hottest casino is the place where gamblers belong: Horseshoe Tunica Hotel & Casino, with more than 500 rooms including a 14-story tower with 311 dazzling suites with amazing amenities sure to make your Horseshoe stay an incredible one. Horseshoe offers three fine-dining restaurants, a large buffet and a snack bar. Whichever you choose, your Tunica accommodations you’re sure to love. 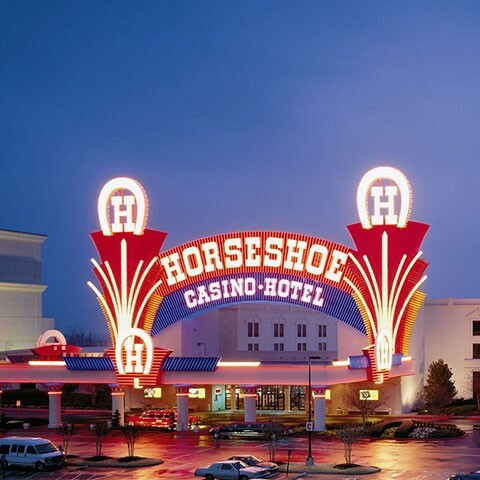 Horseshoe Tunica is known for catering to serious gamblers, particularly table games players, and is known for its liberal, player-favorable rules and its comp policies. The casino features more than 70 table games, more than 2,000 slot machines and a large poker room. Since 1951, casino gamblers have found the highest limits and the best odds at Horseshoe. Here at Horseshoe Tunica, you can square off with Lady Luck, with the highest limits and 100x craps odds. So find your lucky table and pull up a chair – from BlackJack, Craps, Roulette, Let It Ride or Three Card Poker. If you’re a slots gambler, this is the place for you. Choose from over 1,700 games including video poker in denominations all the way up to $5, our exclusive in-house progressive Binionaire slots, with top jackpots starting at $150,000, and over 400 progressive games in all. For the high-stakes gambler, Horseshoe boasts the most elegant and legendary high-limit slot room in Tunica, with the only $500 Red, White and Blue game in town. Some of most popular games include Triple Cash, Double Diamond, Mr. Cash Man, Sizzlin’ 7s, Ten Times Pay and Monopoly.